There are many banana dessert recipes, from banana ice cream recipes to easy banana bread recipes. Here I am going to cover many of those recipes in between. For those summer cookouts how about trying fruit kabobs on the grill. It is a nice light dessert to end the meal with an abundance of flavor. We are all familiar with the most popular of all banana recipes, banana pudding. I have never been to a summer cook out and very few carry in dinners without the presence of banana pudding. 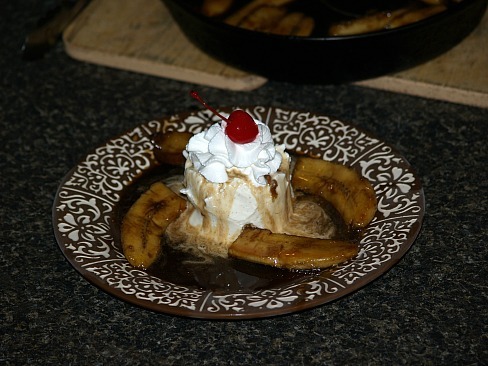 The next famous dessert, especially in “dinner” restaurants is banana fosters. This is a wonderful most delicious dessert. Banana dessert recipes, like other desserts can be a combination of many other ingredients. Most other fruits, especially pineapple and cherries are delicious when combined with bananas. You will often find the recipes will utilize cake mixes, pudding mixes or packaged whipped topping. Very common ingredients which put our desserts “over the top” are nuts, marshmallow and fresh whipped cream. Bring milk, butter and water to a boil on slow heat. In a separate bowl, blend together sugar, cornstarch and eggs. Pour into milk mixture and cook until thickened. Add vanilla. In a large bowl, layer vanilla wafers, a layer of sliced bananas and then a layer of the cooked pudding. Continue layering until all the pudding is used up. Top last layer of pudding with the shredded coconut. Prepare pudding to package directions; set aside. Mix cake according to package directions. Pour into a greased and floured 9x13 inch baking pan. Bake as directed on package. Mix pudding as directed on package and refrigerate to set slightly.Cook pineapple and sugar for 5 minutes. Spread this mixture over the cake; let cool. Slice thick slices of bananas and place on top of pineapple mixture. Spread the pudding over the bananas. Spread the Cool Whip over the pudding and top with pecans and cherries. Refrigerate until serving. This is a simple Banana Dessert Recipe. Combine honey, whiskey and lemon juice; add pineapple chunks, banana pieces, orange and cherries. Toss fruit to coat and refrigerate for two hours. Remove fruit with slotted spoon reserving the liquid to brush on fruit kabobs while grilling. Thread fruit on skewers alternating different fruit. Many of the banana dessert recipes are special to serve when entertaining such is this Bavarian cream recipe. Here again we have the delicious combination of chocolate and bananas. Dissolve lemon gelatin in boiling water and pour ½ cup of the gelatin in the bottom of a loaf pan; refrigerate until firm. Slice bananas thin and add to remaining gelatin mixture stirring gently until bananas are coated. Remove banana slices with a slotted spoon and arrange in lengthwise rows over set gelatin. Spoon remaining gelatin over the bananas and refrigerate until set. 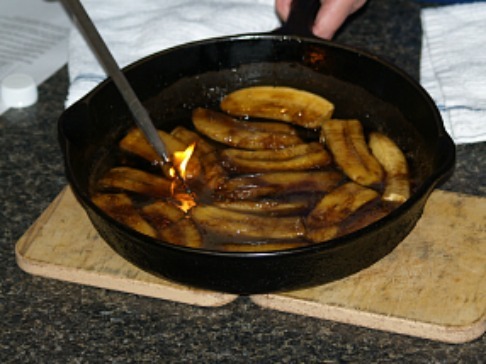 Of all banana dessert recipes, actually any of the banana recipes, the bananas foster recipe is the most famous. This exquisite dessert is served in many of the upper scale restaurants in the United States and in the world. This dessert was created in New Orleans and is typical of the rich flavorful cuisine of the area. When this elaborate dessert is served properly, the blazing flame electrifies everyone in the room. NOTE: THIS RECIPE REQUIRES CAUTION IN MAKING DUE TO THE FIRE. 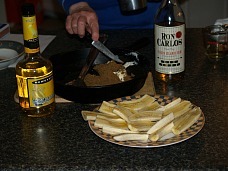 Add sugar and cinnamon stirring until sugar dissolves; stir in the banana liqueur. 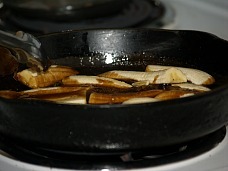 Place bananas in the pan and cook until tender. 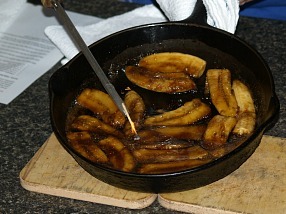 NOTE: If you chose not to flambe add rum and cook until hot. This is the point of serving; have the scoops of ice cream ready. 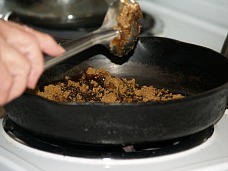 TO FLAMBE tip the skillet slightly and pour rum over the sauce; ignite the sauce. As soon as the blaze burns out, scoop bananas and sauce over the ice cream. Delicious! Combine and blend sour cream, sugar and salt. Mash bananas and sprinkle with lemon juice. Stir bananas, cherries and nuts into sour cream mixture. Spoon mixture into paper lined cupcake tins; freeze until serving.